Simply slip over hair...then twist. 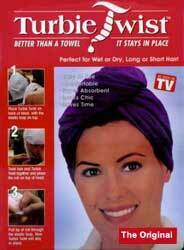 The Hair Towel that’s specially designed for wrapping wet or dry hair. Simply slip over hair...then twist, loop and it’s there to stay! 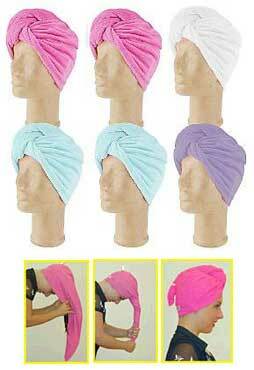 Turbie Twist’s tapered design fits on any head, is lightweight. This Hair Towel is attractive, functional and so comfortable! One size fits all. You’ll never use a bath towel again! My sister got me one 5 years ago? I have been using it ever since. I wash it at least 2 times a week. And if it is ever in the dirty clothes and I need to wash my hair, I hate it! Have been meaning to buy another one for years and just have not done it. It is just great. It keeps your hair up and out of the way until you are ready to dry it. I really need 2 more!